With nearly 20 years of experience, Captain Ashish Scherchan was the man for the job in ‘rescuing’ us from leech central with his trusty engineer, Anil Basnyat in a 9N AKA helicopter. We could not be in better hands for the precarious journey through the Barun valley up to the final destination of Base Camp at an altitude of 4700m. Flying at altitude presents more than its fair share of challenges primarily due to the ‘thinness’ of the air. 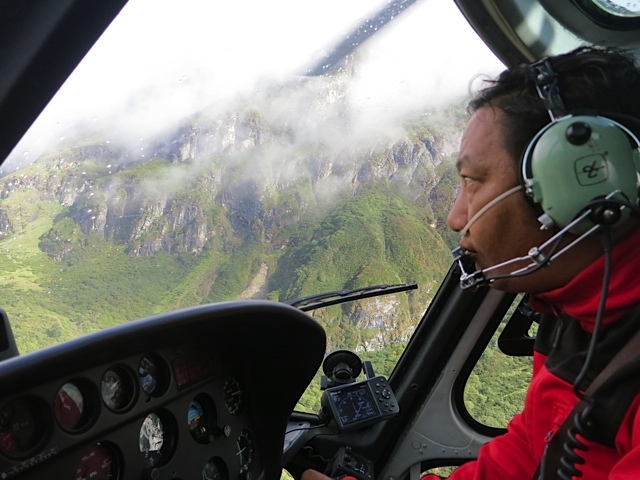 Captain Ashish is a pilot with Fishtail Air - a helicopter charter company operating within Nepal, with its base in Kathmandu. The company operates primarily throughout Nepal with occasional trans-border flights to Bhutan and India. With a fleet of four helicopters, which includes two AS 350 B3 "Ecureuil", one AS 350 B2 "Ecureuil", and one Bell 206B III Jet Ranger helicopter, they have established themselves as one of the largest helicopter operators in Nepal. Fishtail Air operates flights for sightseeing, rescue, medical evacuation, corporate movement, project support, expedition works or any other purposes that need the services of a helicopter. Our next shuttle from Leech central was a 15 minute heli-ride to yet another thriving metropolis – this one with a population of about 5 with about 15 children. The weather was certainly changeable as we began to gain altitude. The pockets of air made for a bumpy ride and you could certainly ‘feel’ the changes in the weather and hear the blades of the helicopter go into overdrive as we gained in altitude (clearly I’m not a helicopter techie!!). Captain Ashish seemed relaxed and controlled so in spite of the tricky terrain and conditions we knew were were in good hands. I could see Monica’s bright pink hat in the distance as we neared our ‘landing pad’ - a giant green marsh / waterlogged field (would make a fabulous cricket ground when drained!! Perhaps the next Bunbury match?). We were assured by Captain Ashish that it didn’t have any leeches however he did mention that he did find 3 of them hiding in the heli that morning..! Now that leeches were no longer a threat, my next area of concern was the fact that our heli would ‘drown’ in the marsh..! We landed gently on the grass and unloaded the bags before the heli took off and headed back down the falley to collect another load of bags and the fuel required for the final and subsequent shuttle to Base Camp. Sure enough, as if right on schedule, the weather closed in again leaving us ‘stranded’ in the swamp, staring anxiously at the sky waiting for the cloud to part and for the heli to reappear. Amazingly it did…! But just in time for the weather to close in again. Ashish indicated that the 11am flight would almost certainly be the last flight of the day unless the weather cleared. We unloaded the last of the bags and settled into the lodge for what was suspected to be the remainder of the day. Whilst the thriving metropolis of Yanglekharka didn’t seem the most comfortable place (eg. It certainly wasn’t the Hilton! ), it was a leech-free, cozy, dry and relatively clean little stop off on our journey into Base Camp. The other advantage of Yanglekharka was that it was at an altitude of 3500m so proved to be a great step in our acclimatization process.